Yeah, but: Choose the one that will get used. 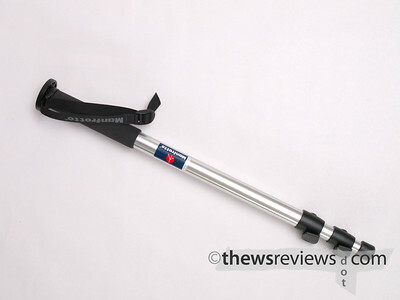 The Long Version: A group review of these two monopods seems appropriate, since they're both made by the same company, and they're both the only ones that I own. It would be impossible for me to review one without referencing the other. Except for the one-leg extendable camera support attribute, these two are completely different ways to solve the exact same problem. The locks, colour, cost and material give some significant differences to choose from. Naturally, they're also both discontinued, making this comparison useful in only the most general terms. But they both support the same amount of weight, weigh about the same, and are about the same height when collapsed and extended. 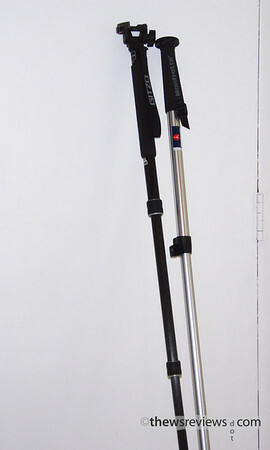 The Manfrotto 679 is a little bit taller, and only compares to the weight of the Gitzo 2941 because it has only three sections, making it longer when collapsed as well. The aluminum-coloured aluminum 679 has been discontinued in favour of the black-coloured aluminum of the 679B, which B&H lists for $45. The Gitzo 2941 is part of the 'Basalt' series, so it's lighter than metal and cheaper than carbon-fiber. The new model is the GM2942, which B&H has for $200. 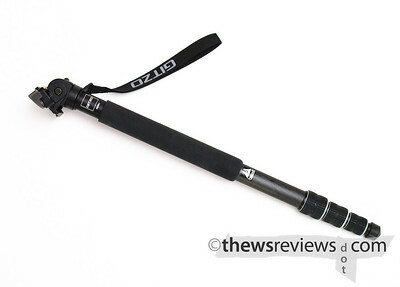 Colour: I highly prefer the black of the Gitzo, but Manfrotto also has black versions available, even though the camping gear store where I bought mine didn't. I prefer black for its subtlety, not least because it doesn't reflect as much in windows. Locks: The Manfrotto has flip-locks, while the Gitzo uses twist-locks. Neither system is hard to use or slow, but I do find the Gitzo's system faster to use and doesn't loosen over time. The flip-locks are bulkier and close with a snap louder than a Sony Alphas' shutter. While a lot of people seem to think that the Manfrotto's system is an upgrade over twist-locks, they're only an improvement over bad twists. Gitzo's system does not fall into that category. Material: Some photographers forget that they're not buying racing bicycles, and look for the weight-savings of carbon fiber and other exotic materials. The reality is that the weight reduction of one's wallet is usually much greater than the weight saved by going with the different tube materials. But unlike ABC detergent, price isn't the only difference - there are real advantages from stepping up to a non-metal monopod. They transmit less vibration, giving a more stable support, and they're much more pleasant to use in a Canadian winter. Cost: The basalt Gitzo tripod costs over four times what the aluminum Manfrotto does, making this an easy decision when cost is a primary consideration. The 679 (and its four-section friend, the 680) is a real workhorse, able to add stability and sharpness to just about any camera/lens combination. It needs no excuses. Verdict: The Gitzo is made of a better material, with locks that are a matter of personal preference, in a colour that's also available from Manfrotto's 679/680 family, and the difference in cost is enough to pay for round-trip Greyhound tickets to an interesting and photogenic place. Spending the extra money seems silly, but what can I say? I use the Gitzo when the Manfrotto sat at home. If the equipment isn't going to be used to take better photos, then it's a waste of whatever money it costs - even if its a great product and a great value. There's certainly nothing wrong with the 679, except for the solvable silver colour, and the rest of it comes down to personal choices. Either one will make your photographs better. Neither one will make your photos better than the other. Get whichever one you'll use.